The template is suitable for presentations about WWII and can be used by students, teachers, scientists and other individuals and organizations. 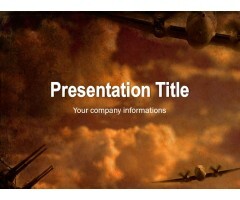 Its background makes it the perfect template for a presentation about the airplanes that were used during the WWII. Make a beautiful presentation with o..